Our vans and buses are available for pre-reception and post-reception shuttles of your guests.We offers wedding specials throughout the entire year. Ask one of our representatives about today's wedding special or Request a Quote online. At Charge & Ride Limousine, we take pride in providing stunning limousines for weddings in the Washington DC, Northern Virginia and Maryland areas. Your special day should be absolutely unforgettable, and we love to be a part of that fantasy. Our ultra stretch limos are top of the line, complete with all the perks of a private plane or hotel suite. Inside, you will find fiber optic mood lighting, a full bar with crystal glasses, sparkling apple cider on ice, plush leather "J" seating, sodas, bottled water, a "Just Married" magnet sign, and red carpet service (upon request). You will enjoy a smooth ride and up-to-the-minute arrivals and departures from your destinations. Furthermore, we can ensure that you arrive in style and make a lasting impression on all your guests. Our uniformed chauffeur will make your entrance and exit in our limousine a vision of perfection. 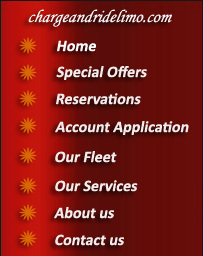 You will be treated with the utmost respect and courtesy and greeted with friendly professionalism. 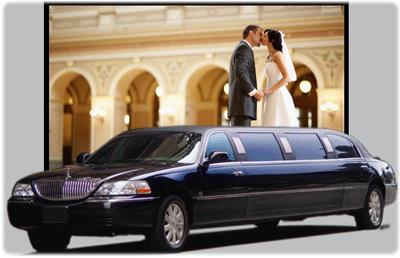 We offer flat hourly rates for all our wedding limo services, and even offer executive sedans for a wedding on a budget. Every bride's fantasy is to pull away from the church in an extraordinary way, and our limousines are modern-day horse and carriages to whisk you away to your reception in luxury. To book your wedding limousine package, fill out our online reservation form or email us at contact@chargeandridelimo.com . For more information, you can contact us directly through our website as well. Let us help you make your wedding day memorable and full of cherished memories to last a lifetime. We understand the hard work that goes into planning a wedding. As a result, we will co-ordinate with you, your wedding planner and photographer in every way in order to ensure that your special day is as you dream it will be. Our customer service representatives will work with you in choosing one or several 6 to 14 passenger stretch limousines for the bride and bridesmaids, groom and groomsmen, the special members of your family as well as for the bride.